As per regulatory requirements, the collection, containment and treatment of waste de-icing fluid are the responsibility of Airport management not individual carriers. 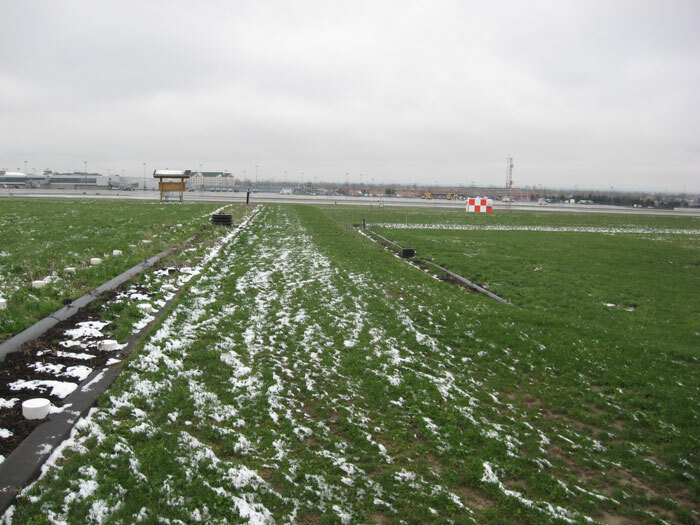 In an article published in airport Improvement Magazine (July-August 2009), it was noted that Buffalo Niagara International Airport (BNIA) spent in excess of $13 million dollars over four years in an attempt to meet regulatory discharge requirements .Despite the substantial investment, the airport was not able to meet its obligations and "continued to exceed allowable levels". Faced with mounting operational costs and discharge limit violations, BNIA was quick to recognize the need for a cost effective solution. The challenge was to develop a management plan that incorporated either off-site or on-site treatment to handle the seasonal variation in flow and BOD concentration. If an on-site treatment system was to be constructed, it could not pose a risk to travelers' safety by drastically changing the environment in and around the airport. This meant excluding alternatives such as lagoons or open tanks which have the potential for attracting birds and other wildlife. Nexom, in collaboration with Urban Engineers, and Stantec designed a novel robust on-site treatment system that proved very cost effective in initial capital and O&M. The system can handle the high flush flow, low propylene glycol concentration of spring. During winter operations, the system is capable of handling the low flow high polypropylene concentration. As an added advantage, the system was integrated with the stormwater management system to produce an effluent quality surpassing regulatory requirements on a year round basis. 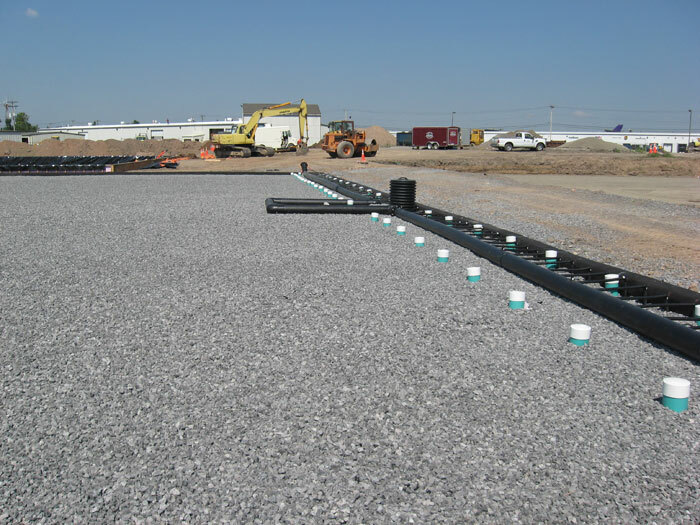 The system comprises of vertical flow aerated gravel bed, a variation of Nexom's SAGR. Underground storage tanks are used to store and equalize flow prior to feeding the SAGR process. Grit removal chambers between the equalization tanks and the SAGR process remove particulate matter that could otherwise adversely affect process pumps and SAGR hydraulics. The gravel bed provides required surface area for BOD reducing heterotrophic bacteria to attach and grow. Air introduced through Nexom's FBA® LINEAR aeration system provides a minimum of 2 mg/L disolved oxygen throughout the bed. The design and operation of the system is loading dependent as opposed to hydraulically limited. As a result, the process can handle a high flow at low BOD concentration (up to 1.2 MGD), a condition typically seen during spring thaw and summer operation, or the process can treat high influent BOD5 (>1000 mg/L) at low throughput to an effluent quality of 30 mg/L BOD5. The bed is sized to ensure a balance between biomass accumulation and degradation. As a result, chances of long term fouling that would result in diminished hydraulic conductivity are minimized. Performance data of the vertical flow SAGR is as seen in the chart. The data plotted in the chart shows performance of the BNIA treatment system over the course of approximately six (6) months. The loading to the system is highest during the coldest of the winter months (i.e. December – March), which is to be expected. Of interest though is the fact that loading during the remaining months is fairly low. Despite fact that bacteria are essentially starved for a better part of year, a vibrant and active biomass is maintained within the system to treat peak loading to 95%+ removal. The extent of biomass reduction in the summer is due to insufficient food supply and predation. The SAGR is not just a simple, effective post-lagoon nitrification system, it can also bring that same efficiency and simplicity to airports looking to treat the BOD-rich aircraft deicing fluid.